I hope this finds everyone in good spirits post Superbowl. I guess there are some very happy people and also some very sad people. For me? The only thing that is really awesome about football is the credits rolling after the game. I am not in to sports at all. I have seen a game live (not professional…but semi? I don’t know the correct term) and did find it a little more exciting than watching it on TV. I’m always surprised how emotionally invested people are to “their team” and some get very angry. I’m just glad it is over. This is Challenge 43 from Bright Owl. I like the zentangling better on this design than the last one. I lost the challenge because I used more tangles, than I probably should have. But I chose these tangles because the reminded of Spring. The patterns chosen were to resemble flower, flower buds, leaves and vines. Now, I’m a newbie and coloring the designs and it’s still a little tricky for me. But I still like it a lot. So, far I’ve seen some AMAZING Zentangle work from the participants of these Zendala challenges. So, you have not done so, when you get some time go to Bright Owl site and click on the names and the bottom of the post. It will take you directly to artist’s blog. 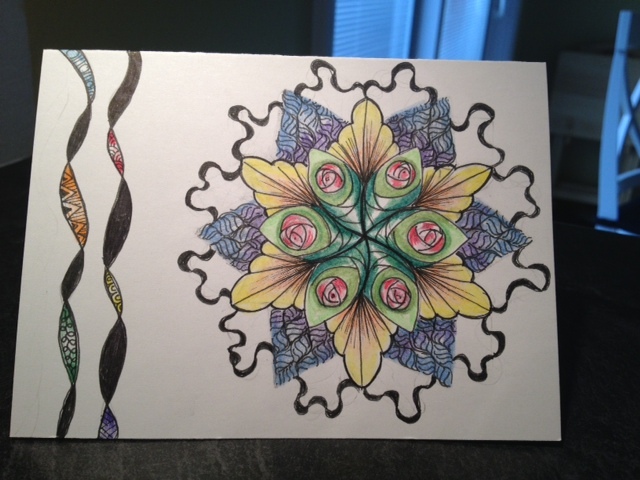 The SB was one of the best SB games ever…..just like this zentangle! I like your Zendala design Carol. Beautful colors and great line work. It looks like a bouquet of flowers. Great. I love the way you put it out of the centre of the paper. Makes a great composition. I’m so glad to hear that you don’t understand all the emotions about sport, whatever sport it may be. I feel the same, but sometimes have the idea to be the only one! Your zendala is very beautiful; the black border gives it something very special. I like the tangles that you used and the colors. The string border really helps set it off. Your shading and color in the middle gives a nice 3D effect.